Lillian Mirviss helped Gap Inc. make great strides in the advancement of corporate renewables by focusing on implementing solar at three distribution centers. Worldwide clothing and accessories retailer, Gap Inc., enlisted EDF Climate Corps fellow Lillian Mirviss to investigate renewable energy opportunities at its North American distribution centers. Having set an ambitious goal of reducing global GHG emissions 50% by 2020, from a 2015 baseline, in owned and operated facilities, the company needed support in exploring on-site renewable energy. After collecting energy use data from the distribution centers and researching case studies of on-site renewable energy at comparable retailer facilities, Lillian identified three potential locations for solar photovoltaic projects – New York, Ohio and California. These sites had the largest footprint of available land for solar development, as well as the requisite state policies to ensure Gap would be credited the environmental benefits. Gathering all the necessary details for each site, including electrical diagrams and 15-minute energy use interval data, Lillian compiled a Request For Information and released it to solar developers nationwide. To prioritize projects with the greatest impact, she developed a financial model that calculated both hour-by-hour financial impacts and overall cost and GHG savings of each project. Lillian also highlighted the next steps Gap can take in its renewable energy strategy to help meet its GHG reduction goal. Over the course of the 20-year contracts, Lillian’s recommended projects in New York and California could save up to $5.4 million total in net operational costs, offset 9.6 million kilowatt hours of fossil fuel electricity and save 2,400 metric tons of carbon dioxide emissions. Lillian presented the projects to Gap’s Environmental Council, leaving them with a better understanding of the role renewable energy has in accomplishing the company’s environmental goal. Lillian Mirviss is a Master of Environmental Science and Management candidate at the Bren School at UC Santa Barbara, where she is specializing in Energy & Climate. 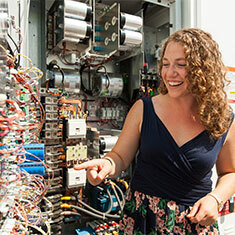 Prior to graduate school, she worked at the California Energy Commission managing energy technology research contracts.